Chinese Temples have been located in Darwin since the first was built in 1887, then rebuilt several times after cyclones and war. The present Temple was opened in 1977 on the original site after Cylone Tracy destroyed the existing Temple in 1974. People worship here daily, please show the same respect that you would in any place of Worship by talking quietly and not taking photos while people are worshipping. The Power Of Almighty God reaches far and near. Stone Lions, hand crafted in China, guard the entrance. A combination of Buddhism, Taoism and Confucianism is practised, which is common in Chinese communities outside China, although unusual in China itself. The sacred Bodhi tree growing in the Temple grounds is believed to be a direct descendant of the tree under which Buddha gained enlightenment. 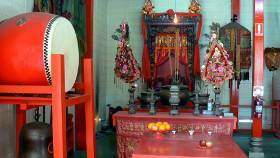 The Temple was also originally used for social gatherings, the forerunner of the Chung Wah Society. The Temple is a five minute walk from the Darwin Mall with entrances from both 25 Woods St and 8 Litchfield St. The Temple is open every day between 8.00am and 4.00pm. There are no entry fees although donations are gratefully received for the care and maintenance of the Temple. The Chinese Museum, located on the same site inside the Chung Wah Society Hall, records the important contribution to the Northern Territory made by the Chinese community. More museums and historic sites. Return from Chinese Temples to Enjoy Darwin Home.